Supporting the Macmillan Cancer Support by hosting a coffee morning has become an annual event for us. This will be our first fundraising event as The Alexandra and we would like to take this opportunity to showcase our renovated venue and the amazing staff that we have working here. This event has become even more important to us since we lost one of our own to cancer last year. Graham Boddy was the maintenance manager here for 27 years before he very sadly passed away on the 9 September 2017. Graham's commitment to his work was what made The Alex the family environment that everyone is proud to work in. During the 4 months that he was undergoing treatment the Macmillan team were incredible. Over the past few months we have had a lot of renovation projects taking place all around the venue, and if Graham was still with us he would have been so proud to see the changes that have been made. Which is why our coffee morning is a celebration of our venue and staff, in memory of Graham. We will be showcasing our baking talents, as well as musical talents with some members of our Front of House team playing and singing live for your entertainment. We will also have some raffles which you can enter to win cake and even some free tickets! It really will be an event not to be missed. So please come along and help us to raise as much money as we can for this wonderful charity, so they can keep helping as many people as they can, people who are suffering with this terrible disease. We at The Alex will forever be grateful for everything they did for Graham. 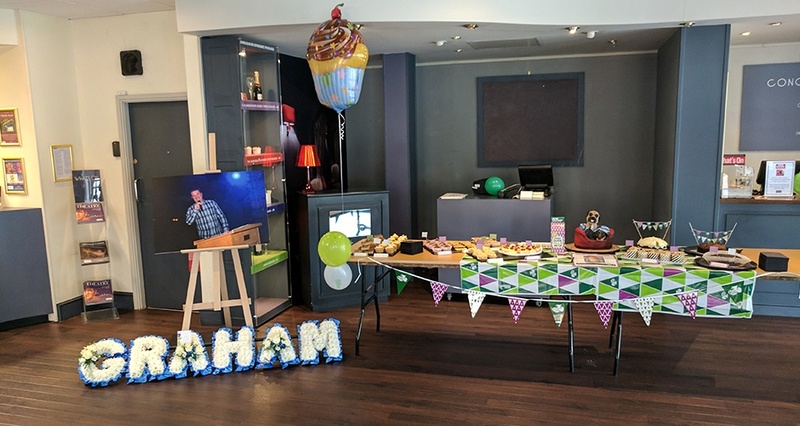 This is a time for our whole venue to come together and celebrate the end of our long summer of renovations, to celebrate the life of Graham Boddy, and most importantly to celebrate the wonderful work that Macmillan do. Why not join us this Friday 28 September 2018 as we take part in the World's Biggest Coffee Morning?